Groups campaigning for women's and LGBT rights took the streets of Verona on Saturday as church leaders and pro-life activists met for a conference on family values. The protesters were there to oppose the World Congress of Families, whose self-declared goal is to restore what it calls the "natural family order". 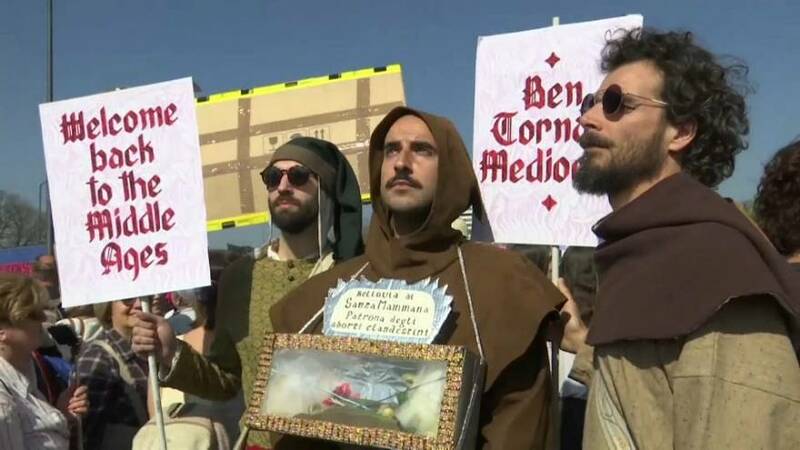 "In Italy there is currently a very serious attack against all the rights and freedoms that have been conquered by women," demonstrator Maddalena Saccone said. "There is talk of taking back the freedom of abortion, divorce and family law. These are struggles that were thought to have already been won." Police were deployed outside the conference and a counter-demonstration — by groups supporting the conference's aims — was also held. Olimpia Tarzia, an anti-abortion activist, said: "(The Congress) wants above all to restore meaning and value to what the family is, the reconciliation of women between lifetimes and work times and the true freedom of women." The three-day conference in Verona is funded by the local council and is backed by the far-right League Party, which is a partner in Italy’s current populist coalition government.